1. Which question type of geography is given to you? 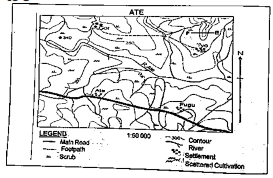 Use the map of ATE to answer question 2 to 5. 2. If the scale of the map is enlarged four times, the new scale will be __. 3. The area marked F—E is __. 4. The highest point on the map is __. 5. The likely occupation of the inhabitants of Ate is __. Use the diagram below to answer question 6 and 7. 6. 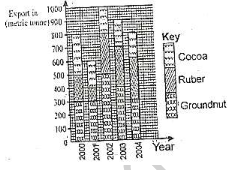 The total groundnut export from 2000 to 2003 is? 7. The total export in 2002 is? 8. In chain surveying, the basic principle is to measure? 9. Which of these planets completes its orbit in a much shorter space of time? 10. Shale is a fire-textured sedimentary rocks formed principally from the particles of? 11. Organic sedimentary rocks formed from the? 12. The intrusive landform produced when magma is cooled within the earth surface is? 13. Which of the following is an agent of denudation? 14. Which of the following rocks is characterized by layer formation and strata? 15. Which of the following seas has the highest salinity? 16. Some lakes are seasonal due to their location in? 17. Which of the following is an element of weather? 18. A line drawn on a map to show places of equal temperature is known as? 19. The term used to describe the vegetation type of the Amazon Basin is? 20. The major factors which determines the rate of infiltration of water into the sub-soils is? 21. The level of development of the soil profile is determined by? 22. Volcanoes are considered natural resources because the provide? 23. Which of the following is a component of a biotic community? 24. The type of coal that burns with great heat and very little smoke is? 25. The most serious environment effect posed by hazardous wastes is __. 26. Which of the following indices is a measure of development? 27. The growth rate of population is determined by? 28. A populated problem faced by some developed countries today is? 29. Which of the following is a favourable condition for settlement site? 30. Which of the following countries is perennial irrigation extensively practised? 31. Dispersed rural settlements are most likely to be found in areas with? 32. Dairy farming is an example of intensive farming commonly practised in? 33. As a country develops a smaller percentage of the workforce tend to be employed in? 34. Developing countries mostly engage in primary economic activities because of? 35. High annual rainfall of at least 1520 mm, well distributed throughout the year with the heaviest during growing season is most suitable for the production of? 36. The main factor influencing the location of manufacturing industries in West Africa is? 37. An agricultural practice that allows a wide range of crops to be grown without fallowing is? 38. Arable farming and animal husbandry widely practised in Britain and many parts of Europe is referred to as? 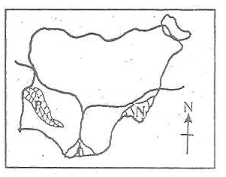 Use the map below to answer question 39 and 40. 39. The area marked P is __. 40. The area marked N is over __. 41. The type of vegetation found on the Mambila Plateau is? 42. Which of the following best explains the reason for the decrease in the practice of bush fallowing in Nigeria? 43. Secondary economic activities are those that involve the? 44. The reason for seasonal migration of nomadic herdsmen is? 45. The main industry associated with the Ruhr Valley region is? 46. Which of the following factors influenced the growth of the Ruhr Valley? 47. The largest producer of timber in Africa is? 48. The relatively low level of rail transport development in tropical Africa has? 49. The high population density in the Nile Valley is as a result of? 50. Which of the following population characteristics is the best related to African countries?